With Christmas approaching rather fast, I am starting to get all my pressies ready to be shipped to our loved ones overseas. Let me ask you this: What do grandmas love more than anything else in the world? Correct, their grandchildren! So, I figured, they also must love artwork from said kids. My mom lives in Germany where we have what is called 'Kaffeeklatsch', where basically a bunch of women get together, eat cake and drink well, coffee. Yes, real fancy. Well, it's for my one and only Mama!!! Anywho..... 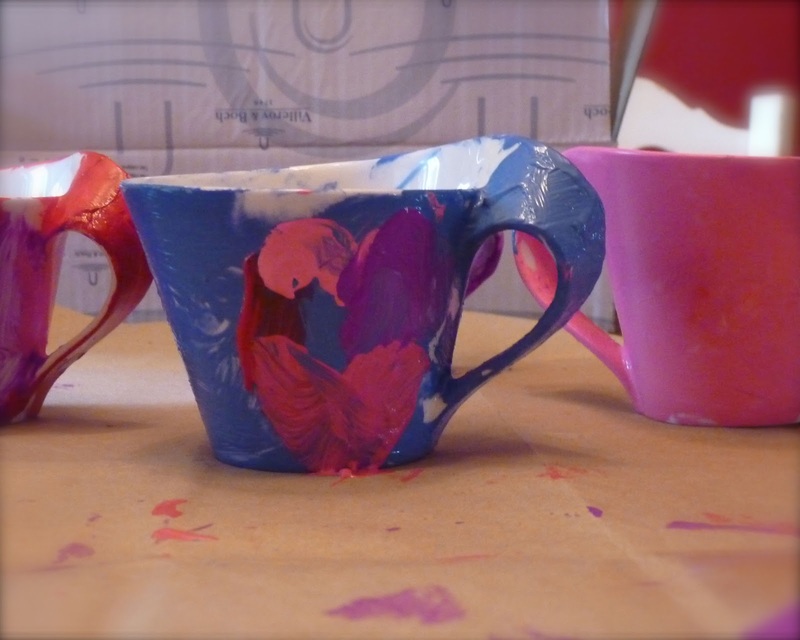 I covered the table and the girl and she painted those mugs. What's next: Well, after one day of drying, they will be baked in the oven for about 30 minutes at 325F and TADAAA! Personalized Christmas pressie for a Kaffeeklatsch Oma!